Mortgages are the largest form of household debt and their increase of $139 billion was the most substantial increase seen in several quarters. Unlike overall debt balances, which last year surpassed their previous peak reached in the third quarter of 2008, mortgage balances remain 4.4% below it. 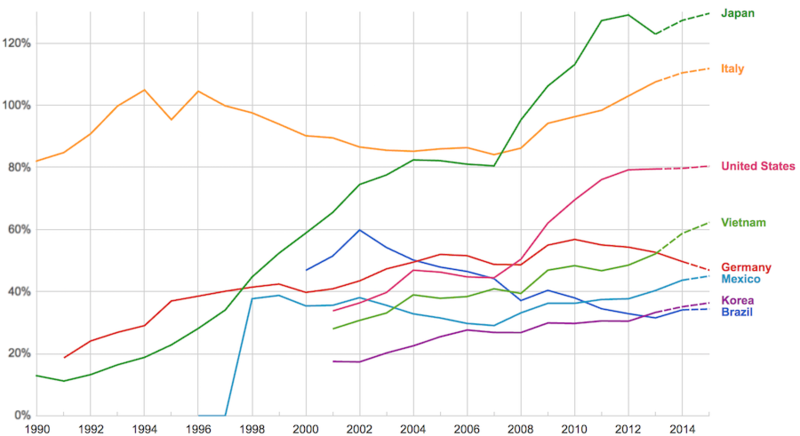 The New York Fed issued an accompanying blog post to examine the regional differences in mortgage debt growth since the previous peak. As of December 31, 4.7% of outstanding debt was in some stage of delinquency. As the chart shows mortgage and credit card debt delinquency rates have decreased sharply since 2010. Student loan debt delinquency rates have increased substantially during the same period (and delinquency rates for student loans are likely to understate effective delinquency rates because about half of these loans are currently in deferment, in grace periods or in forbearance and therefore temporarily not in the repayment cycle. 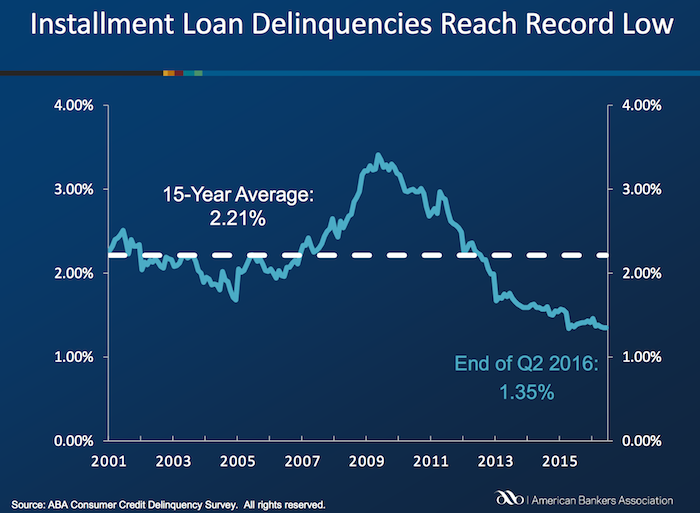 This implies that among loans in the repayment cycle delinquency rates are roughly twice as high). You can understand why many see student debt as a huge economic problem the economy is facing in the coming years. Of the $619 billion of debt that is delinquent, $406 billion is seriously delinquent (at least 90 days late or “severely derogatory”). 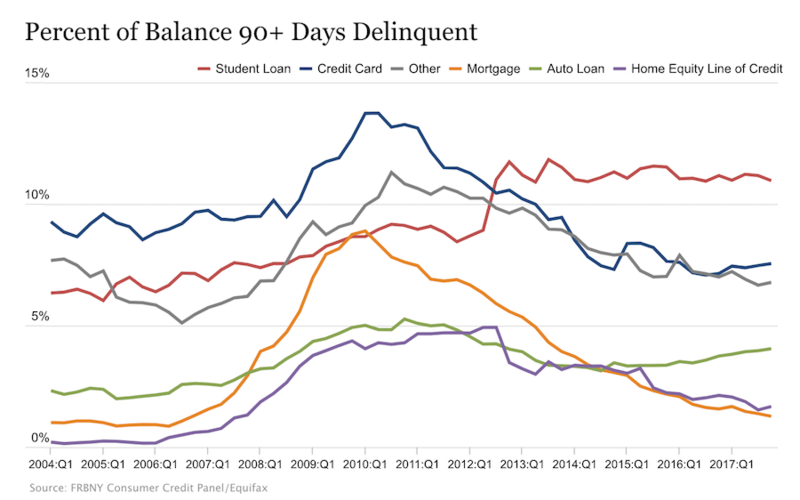 The flow into 90+ days delinquency for credit card balances has been increasing notably from the last year and the flow into 90+ days delinquency for auto loan balances has been slowly increasing since 2012. With just $2,500 you can spread your investment across 100 Notes. 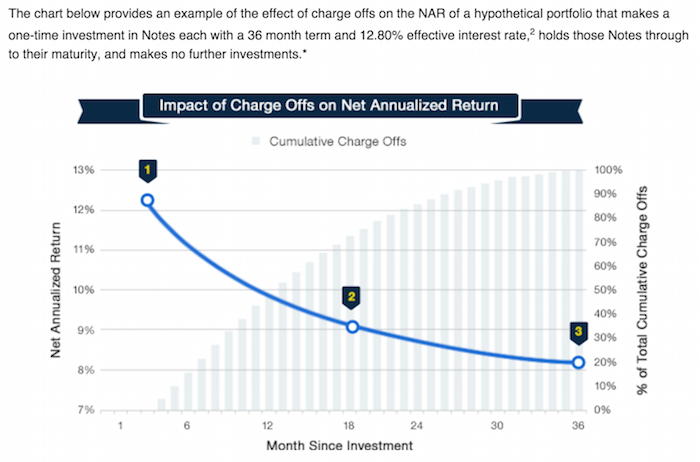 99.9% of investors that own 100+ Notes of relatively equal size have seen positive returns. This chart, from LendingClub, shows a theoretical (not based on past performance) result. The basic idea is that as the portfolio ages, more loans will default and thus the portfolio return will decline. This contrasts with other investments (such as stocks) that will show fluctuating returns going up and down (over somewhat dramatically) over time. For portfolios of personal loans diversity is very important to avoid the risk of getting a few loans that default destroying your portfolio return. For portfolios with fewer than 100 notes the negative returns are expected in 12.8% of the cases (obviously this is a factor of the total loans – with 99 loans it would be much less likely to be negative, with 5 it would be much more likely). I would say targeting at least 250 loans with none over .5% would be better than aiming at just 100 loans with none over 1% of portfolio. There are several very useful sites that examine the past results of Lending Club loans and provide some suggestions for good filters to use in selecting loans. Good filters really amount to finding cases where Lending Club doesn’t do the greatest job of underwriting. So for example many say exclude loans from California to increase your portfolio return. While this may well be due to California loans being riskier really underwriting should take care of that by balancing out the risk v. return (so charging higher rates and/or being more stringent about taking such loans. So I would expect Lending Club to adjust underwriting to take these results into account and thus make the filters go out of date. Of course this over simplifies things quite a bit. But the basic idea is that much of the value of filters is to take advantage of underwriting weaknesses. This chart (for 36 month loans) is an extremely important one for investors in peer to peer loans. It shows the returns over the life of portfolios as the portfolio ages. And this chart (for LendingClub) shows the results for portfolios of loans issued each year. This is a critical tool to help keep track to see if underwriting quality is slipping. I really really like your work and webcasts (example included below). This seems to me to make it really difficult on people trying to use judgement. Calling people’s actions “extremely paternalistic” if they are not definitely so, I think impedes debate. And I think debate should be encouraged. When making Kiva loans I do steer away from loans with rates above 40% (I also prefer loans that are geared toward a capital investment that will increase earning power going forward though this is hard – lots of loans are essentially for inventory that will be sold at a profit so a fine use of loans but not as powerful [in my opinion] and new capital investments – say a new tool, solar power that will be resold to users…). 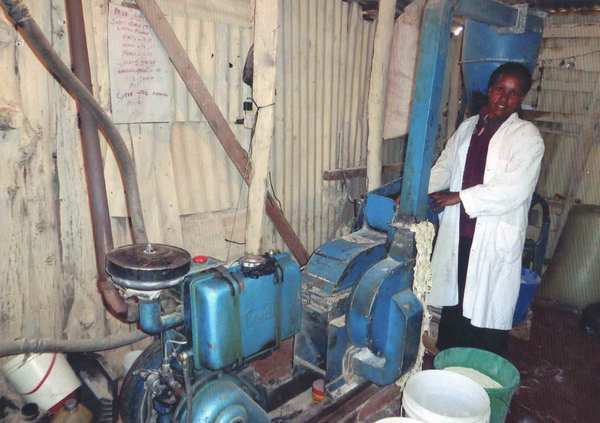 Just like people anywhere, people taking Kiva loans are capable of getting themselves into trouble. Choosing to allocate my lender toward certain loans does not mean I am being paternalistic. I am not being paternalistic if I chose not to invest in the stock of some company that vastly overpays executives and uses high leverage to do very well (in good times). I do like the idea of direct cash to people in need. I give cash that way (and in fact did it a long time ago, 20 years, for several years – before any of this new hipster cachet :-). And I still do like it.